Shooting a bird with a camera is no easy task. 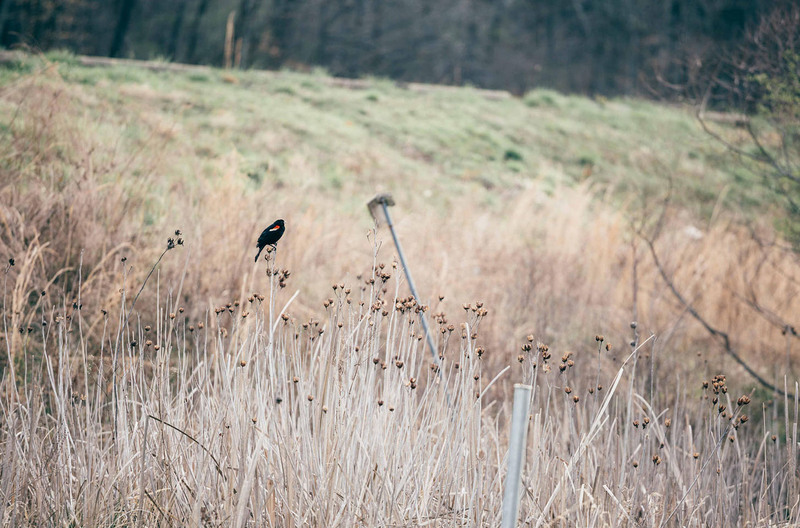 As Andres darted cautiously around camp with tripod and camera in tow, I couldn’t help but wonder if the red-winged blackbird was just teasing him. The sly bird seemed to know exactly what was going on, flying to a different branch or cattail every time the lens pointed his way. While Andres became more exasperated, I could only smile and enjoy the rich morning call. The bird seemed to be competing with a nearby male who raised his voice every time our clever neighbor ended his song. It was the only sound breaking across the lake. Though they were hard at work defending their territories, the rhythmic calls were immensely soothing after a damp and cold night during our recent adventure in southern Ohio. Andres concentrates on the red-winged blackbird. The blackbird awakes to this view every dawn at Strouds Run State Park. The blackbird stayed with me long after dawn, his song sparking a reflection about our connection with nature. I thought of Rachel Carson’s book Silent Spring and thanked the stars that her prophecy of a spring without songbirds had not yet come true. We take them for granted, these little beings that are powerful enough to sing above the grind of city streets, if you listen right. Carson wrote her famous book in 1962 during a time when pesticide use and other forms of industrialization were threatening the future of birds and our own existence in this world. Her words remind me of a National Geographic article I recently came across called This is Your Brain on Nature. Making a scientific case for immersing ourselves in the natural world, it very much supports what many of us instinctively know. We simply feel good and perform better when we’re surrounded by nothing but trees, wind and birds. The studies are intriguing and underlie the need for more green space and access to the outdoors, particularly among young folks. I was shocked to learn that only 10 percent of American teens spend time outside. 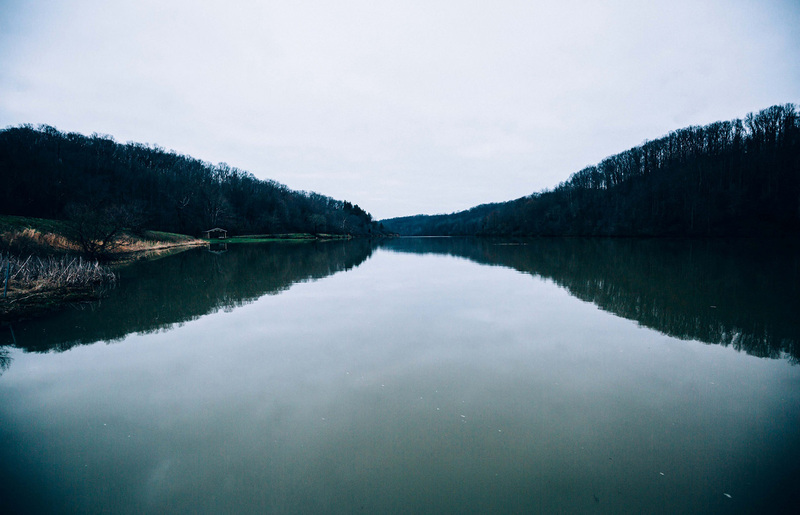 We know more time outside can greatly reduce disease and mental health conditions, everything from obesity (and resulting health issues) to depression. This is one of the many reasons why we need parks. Yet visits to the parks are down. These are troubling facts in a day and age when more connection to our natural world is needed if we are to survive in it. Parks are essential places of learning and growth, where programs can enrich the lives of children at camp or soothe the soul of a lone wolf. Even the barest of trees in a city park offer refuge to the cosmopolite or kid who can’t afford a Yellowstone vacation. So how do we inspire people to get outside? According to the National Geographic article, some doctors are even prescribing time outdoors! It may be one solution, but my instinct is to rely on the power of art and visual media to connect us with our natural world. 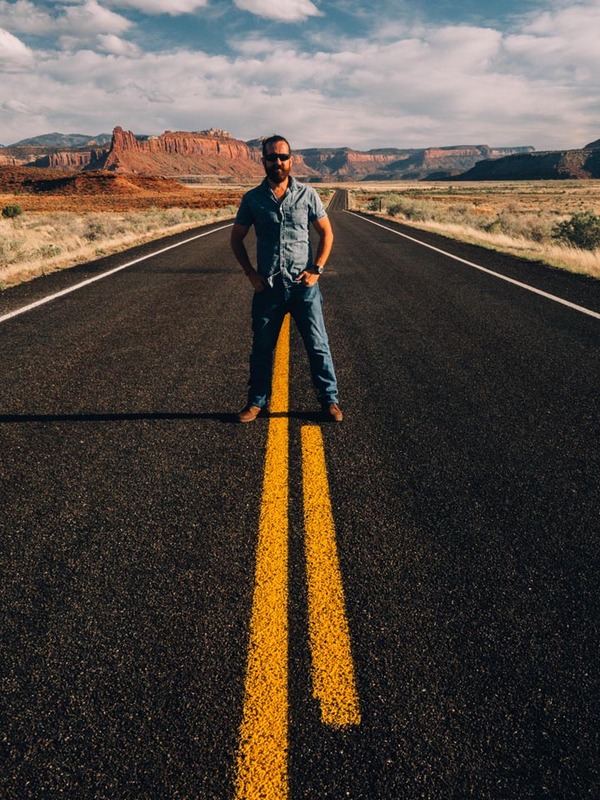 The National Park Service has launched an expansive campaign called Find Your Park in celebration of 100 years in existence, utilizing a myriad of social media channels and public challenges to spread the word of our parks. 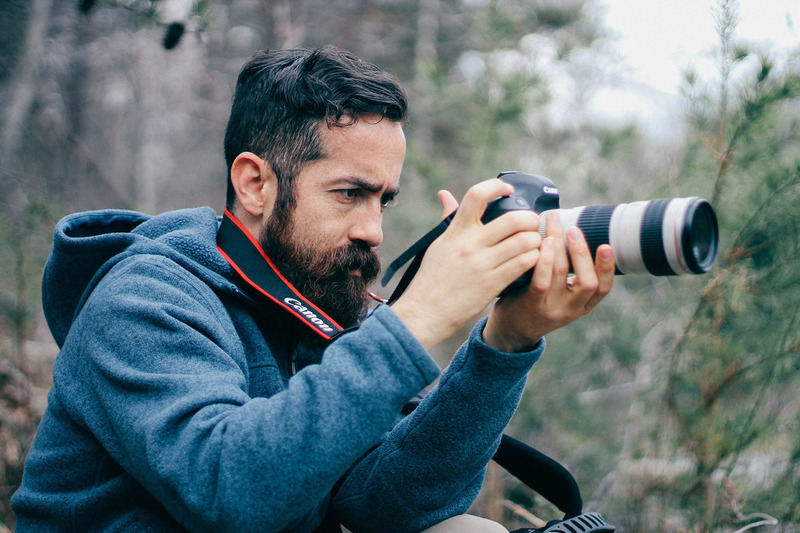 Anyone can become creative and snap a thoughtful shot, sharing it on Instagram with #findyourpark. The feed shows artwork as well, and this is where we feel most at home. It seems anyone can become a steward in his or her own way, creating videos, poems, paintings and more to express our passion for mountaintops and meadows. Perhaps these are the voices that will spread through the sands of media, inspiring wonder along the way. This is precisely how Andres saw his first bison and eventually came to the path we are embarking on today. He dreamed of seeing that animal from his childhood days when he first saw one on National Geographic many years ago. Spreading the call of nature through art is our mode of sharing the story of parks, places where we can all find something meaningful to enrich or calm our lives. One day I imagine sitting with a group of kids, sketching red-winged blackbirds with them, and perhaps that is an opportunity we will encounter along this quest. Through art we are forced to be still and study the places and animals we depict, which naturally creates a connection to those things. I believe this process would have a deeply soothing impact on all folks. It doesn’t matter if you’re an artist or not. Touched by the blackbird’s song, I later sketched him and a female using the photos we managed to capture. At the time I thought this was my first encounter with the bird, but in the two weeks since that moment I have seen him everywhere. I realized he’s always been around, I’d just never noticed before sketching him. So you see, art taught me to see his presence. My most recent encounter occurred in The Wilderness World of John Muir, a selection from his collected work. I’ve been jumping around the book and ironically came across a red-winged blackbird passage just two days ago. 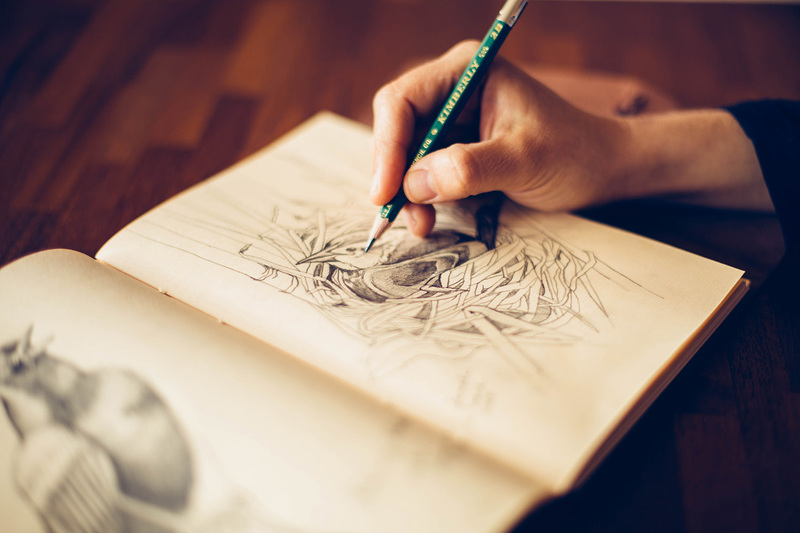 It was an inspiring read as I developed the sketch to its final illustration, using digital painting techniques we apply for our work. The result is one of many naturalist prints to come as we encounter all 59 National Parks of America and celebrate this great, wild country. 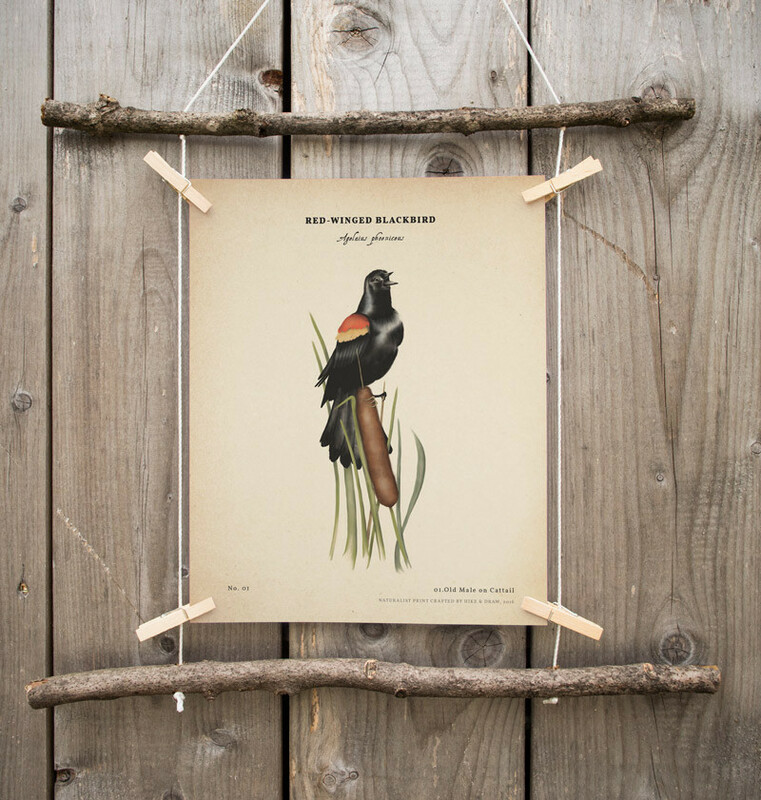 Our final Naturalist Print of the red-winged blackbird, Hike & Draw 2016. 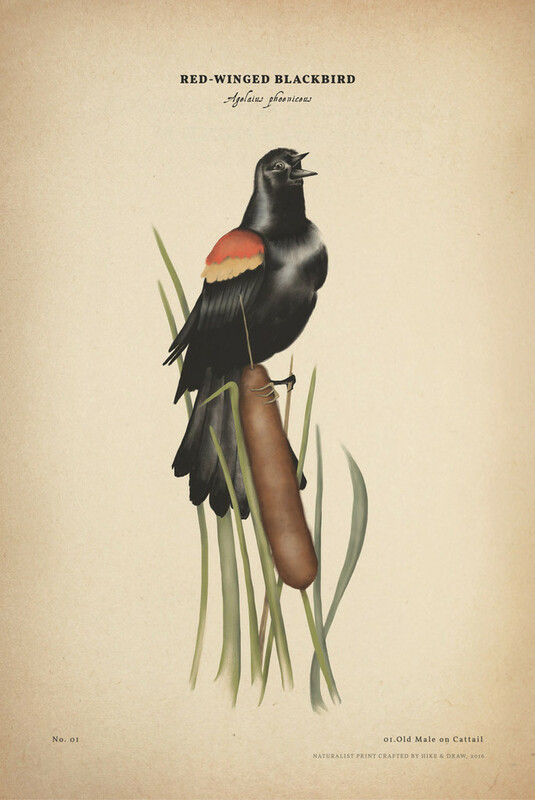 One of the gayest of the singers is the red-wing blackbird. In the spring, when his scarlet epaulets shine brightest, and his little modest gray wife is sitting on the nest, built on rushes in a swamp, he sits on a nearby Oak and devotedly sings almost all day. His rich simple strain is baumpalee, baumpalee, or bobalee as interpreted by some. In summer, after nesting cares are over, they assemble in flocks of hundreds and thousands to feast on Indian corn when it is in the milk. Scattering over a field, each selects an ear, strips the husk down far enough to lay bare an inch or two of the end of it, enjoys an exhilarating feast, and after all are full they rise simultaneously with a quick birr of wings like an old-fashioned church congregation fluttering to their feet when the minister after giving out the hymn says, “Let the congregation arise and sing.” Alighting on near-by trees, they sing with a hearty vengeance, bursting out without any puttering prelude in gloriously glad concert, hundreds or thousands of exulting voices with sweet gurgling baumpalees mingled with chippy vibrant and exploding globules of musical notes, making a most enthusiastic, indescribable joy-song, a combination unlike anything to be heard elsewhere in the bird kingdom; something like bagpipes, flutes, violins, pianos, and human-like voices all bursting and bubbling at once. Then suddenly some one of the joyful congregation shouts Chirr! Chirr! And all stop as if shot.